WhaleClub.co Review 2019 – Scam or Not? Whale Club is a relatively young trading platform which now serves over 15,000 traders every day. The company is based in Hong Kong, and it started live trading in January 2016. The founder of Whale Club is Perry Steegen, a former banker and technology enthusiast. The exchange is providing service in over 190 countries, allowing traders from all around the world to buy and sell cryptocurrencies with ease. Interestingly enough, Whale Club doesn’t require identity verification at all. That makes it one of the rare exchanges that do not require any sort of verification. Another popular option is Russian BTC-e, you can read our review here. The exchange has a strict “no fiat” policy meaning they don’t use the banks or any similar traditional institutions or fiat currencies in their operations. There are no fees when it comes to deposits, withdrawals, and trading on Whale Club. The exchange doesn’t have any limits when it comes to deposits and withdrawals, as well. The transactions are processed even on weekends and holidays, and everything is done manually. The withdrawals are processed manually at set times of the day, following the strict protocols. The reason for manual withdrawals is the security, as it allows the exchange to keep all of the customer funds in cold storage, separated from the platform and out of reach for potential attackers. Whale Club doesn’t accept FIAT currencies. Every single operation on Whale Club is processed in Bitcoin – deposits, withdrawals, orders, positions, balances and all other requests. The exchange doesn’t charge any fees on deposits, balances, executions and inactivity. The withdrawal fee is 0.001BTC – which is basically the amount charged by the network for transaction confirmations. Whale Club has fees for leverage users. The margin trading for cryptocurrencies is available 24/7. Max leverage is 10x, with a max size of 30BTC. The spread is 4.8, and the financing rate is 1.8 percent. Max leverage is 3x, with a max size of 3BTC. The spread is 0.0006, and the financing rate is 0.6 percent. Max leverage is 5x, with a max size of 5BTC. The spread is 0.001, and the financing rate is 38.2 percent. Max leverage is 5x, with a max size of 10BTC. The spread is 0.04, and the financing rate is 0.5 percent. Max leverage is 5x, with a max size of 5BTC. The spread is 0.001, and the financing rate is 0.6 percent. The fees for all other trading pairs can be found here. Whale Club is a bit specific exchange, as it only offers margin trading. Standard open book trading without leverage is not supported. Whale Club also offers stock trading for ten corporations, which can be found here. The exchange also offers a comprehensive guide for new traders. You can check it out here. The exchange also offers Turbo trading, a sort of binary options gambling. Users predict will the price rise or decline within a given time period (usually 1 to 5 minutes). If the user is correct, it makes a profit equivalent to the payoff shown here. If not, it loses the amount invested. Whale Club has one of the best user interfaces out there. Every step has been simplified and explained in details, allowing new users to start trading in no time. The website is fast and intuitive, and everything works like a charm. There are no apps for Android and iOS, but the design is responsive and looks good on mobile devices. They also have a great API, which serves a large number of traders. The support on Whale Club is good, but it can be only contacted through tickets. Email and phone support are not available. What lacks in accessibility it makes up with fast response time, quality answers and an extensive knowledge base. There are not many complaints about the exchange, and they are usually related to high funding fees. There’s a war on Bittrust, as some users accuse the exchange of posting fake reviews. Nothing else pops up; users are generally satisfied with the platform. The trading platform also has a great referral program which gives 50% of all commissions generated by anyone who signs up through affiliate’s link, forever. According to online reviews, this is the highest paying Bitcoin affiliate program. More information are available here. On this page you can find coupon codes for Whaleclub.co. The exchange keeps 100 percent of user funds in cold wallets, and the keys are stored at max-security locations. The servers are always run with the latest software and with strict security policies. Two-factor authentication is available for all user accounts, and all communication between Whale Club and clients is encrypted. The trading platform was never hacked. The only security flaw – no SMS alerts. Email alerts are available. Whale Club is one of the rising stars in the industry. It provides anonymity and a bit different service than we’re used to seeing, making it a real refreshment in the market. A great exchange with a lot of potential. Different from the competition, in a good way. anyone have any updates on them just packing up and leaving with our money? any lawsuits yet? Thanks to all that warned me about this site. I have deposited 3.24 ltc , open 3 positions , close them in total zero profit , but my balance dropped to 2.686 , I have sent email to the support , I will share the results here , I was suspicious about being scammed .why I didnt use bitmex or bitfinex ?! Because we’re iranian , and prohibited from bitmex , not idiots . Funny you can’t leave a star rating but it’s got 5 stars lmao . This place is such a scam it’s fraudulent!! Keep your crypto way away from here or you’ll never see it again ! Had so many issues since my time being on this site they should call it The Donate Club. Everyday my balance would be less and less on trades. I kept writing support but they didn’t answer. So that’s when I found out their fees are 30% a hour on your own money !!!! They are charging you interest fees on my own damn balance. This place is highway robbery. I won’t be donating anymore. Oh and when I said something in chat about the fees I was banned from talking !!! What a joke you people are scum of the earth ! STRAIGHT UP SCAM! BEWARE OF WHALECLUB! the missing bonus payments but same here, no reply from whaleclub after that! 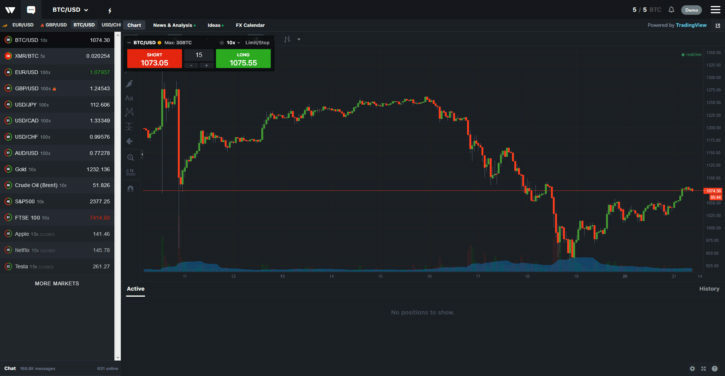 200 USD in the red… a few minutes later these fees are added and the same trade is 300 USD in the red!! Also, you can not find a real location/address of whaleclub anywhere on their website. No regulation, nothing! Even in their chat the users warn everybody to trade there, they just use the chat for fun. It´s a true scam and they rip you off and don´t stand to their bonus offering and ignore your support tickets. deserve but for now, i´ve lost much money and it leaves me to wanr everybody about that fraudulent website!! Contradiction on announced fee with applied. Open ur eyes before open/close any contract. I agree with your review. I’ve been on Whaleclub for about a year now and have had a positive experience. The chat room is always active with traders, which is great especially in times of volatility = high action. Customer support is very responsive and you can set the leverage/margin per trade – 2 features which IMO separate them from the rest. Would like to see more crypto markets in the future. We review each comment so give us one day time. I wrote a very negative review but you erased it. You want to give this totally SCAM exchange a 5 stars why you ask us for our review?!!! This way you lose credibility. I tried to send them many emails and opining many teckets but they responded after 3 days, and easily they said this is our procedure with leverage!!!! I’ve aske them to return my money with profits but they refused???? So they took my balance with the profits!!! Pleas be aware drone them, my user ID is (kfturki) for your all references. It is definitely one of the worst scammers. They closed my friend’s position without permission and took a 53% profit and left his account with 0 $.. my friend’s ID is: kfturki and he wrote them without reply. AVOID AT ALL COST!!! cant get on the website today. has it been shut down? This website is a complete scam. I recently did very well on the site and tried to remove my balance of $38,000. They set my balance to $0 and banned me from their site saying I was conducting “abusive trading” (without defining what that is) and that there is nothing they can do. So essentially if you do really well on their site all they have to do to steal your money is claim your trades were abusive and they won’t pay you a dime. Above you can see my balance at $38,000. This is 107 DASh which is now actually around $55,000 I believe. Once I tried to withdraw from the exchange my balance was immediately changed and I was banned from the site. Here it shows my randomly negative balance with no trades or anything open. Our system detected unusual and abusive trading on your account, which it then automatically suspended. This was a violation of our terms of service, unfortunately. There is not much we can do at this time.